« Use Amazon Smile this season! CVES 3rd Annual Golf Tournament! Mark your calendars for the 3rd Annual CVES Golf Tournament! What: We are looking for sponsors and golfers! 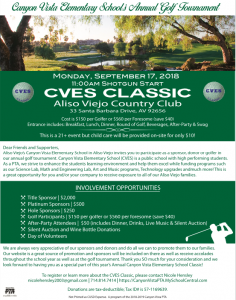 The Golf Tournament is a great way to connect with the Canyon Vista Elementary community, introduce your company or brand to new families, and it’s also a great way to support the school. Get more details here. How: Find Ticket & Sponsorship packages here! And don’t forget, Kids Kave will be open, is only $10 and will help our kiddos with homework!